India’s National Telecom backbone Bharat sanchar Nigam Ltd announced the launch of Pan India CDMA based EVDO wireless broadband service with attractive promotional data tariff. BSNL EVDO data card provide High speed wireless broadband service up to 3.1 Mbps. 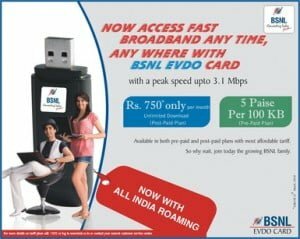 With the Pan-India launch, BSNL introduced new attractive Unlimited Downloads plan (Home and Roam) at just Rs.750 for its postpaid EVDO Data card subscribers across India (except Mumbai/Delhi MTNL service area). With the promotional plan subscriber can access High speed wireless Internet with unlimited Downloads-Uploads while on move across India. The operator also unveils Pay As per Use Plan for prepaid customers with default tariff of 5 paisa/100KB (50 paisa per MB) for data usage. The Plan 750 is Promotional offer for new customers activating EVDO postpaid unlimited data plan upto 31.03.2010.They will be charged reduced Fixed Monthly Charge (FMC) of Rs.750 in place of Rs. 999. Existing BSNL EVDO Data Card customers in lower data plan migrating to the unlimited plan during the promotional period will also get the benefit of reduced FMC of Rs. 750. Service Tax as applicable will be charged extra. The above bundle free usage in all Plans will also be available while roaming. The Existing EVDO customers would continue to avail the unlimited data [email protected] 650 per month. EVDO Roaming will be allowed in BSNL circles only.